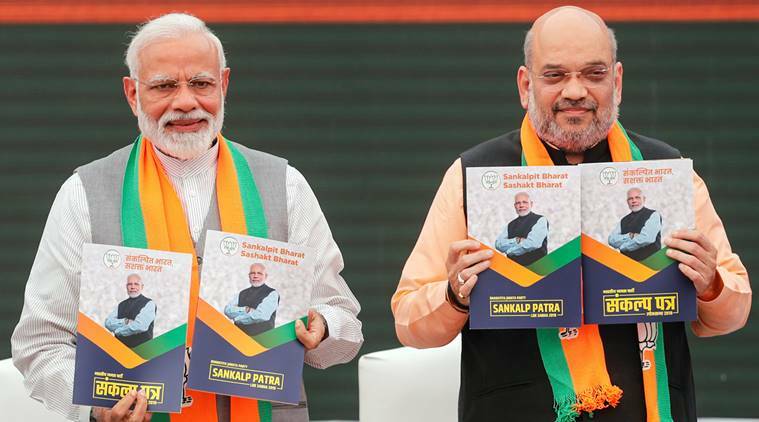 On April 8, 2019, India's Bharatiya Janata Party (BJP) released its election manifesto called Sankalp Patra', 3 days ahead of the crucial General Elections. The theme of the manifesto is "Sankalpit Bharat - Shashakt Bharat" or "determined India, empowered India". Through this manifesto, the party has set up a target to make India a US$ 5 trillion economy by 2025 and US$ 10 trillion economy by 2032. In the last general election held in the year 2014, BJP won 282 seats, leading the NDA to a tally of 336 seats in the 543-seat Lok Sabha - the lower house of Indian Parliament. Eventually, it formed the government under the leadership of Narendra Modi. BJP intends to continue with its policy of "Zero Tolerance" against terrorism and extremism. Also, it will continue to follow the current policy of giving a free hand to the security forces in combating terrorism. Party promises to speed up the purchases of outstanding defense-related equipment and weapons. In order to equip the Armed Forces with modern equipment, it will continue to take focused steps to strengthen the strike capability of the Armed Forces. In order to ensure self-reliance in the procurement of defense equipment, BJP extends its commitment towards "Make in India in Defence" program which will enable indigenous production of defense equipment. In turn, it will also generate employment and encourage investment in the defense sector. The party will continue with the National Register of Citizens (NRC) process in the areas which are on top priority. And, in near future, it intends to implement the NRC in a phased manner in other parts of the country. BJP pledges to annul Article 35A of the Constitution of India as the manifesto claims that "the provision is discriminatory against non-permanent residents and women of Jammu and Kashmir." Party also like to ensure the safe return of Kashmiri Pandits and we will provide financial assistance for the reselement of refugees from West Pakistan, Pakistan occupied Jammu and Kashmir (POJK) and Chhamb. OROP-One Rank, One Pension again found its mention in this manifesto. BJP repeats it commitment of 2014 Manifesto in creating an effective framework for the resettlement of Armed Forces veterans. Pradhan Mantri Kisan Samman Nidhi (PM-KISAN) will be extended to all farmers in the country which will include ₹6,000 yearly income support. ₹25 lakh crore will be spent on the development of rural areas and for the improvement of the productivity of the farm sector. Short-term new agriculture loans up to ₹1 lakh at a 0% interest rate for 1-5 years on the condition of prompt repayment of the principal amount. Voluntary enrollment in Pradhan Mantri Fasal Bima Yojana (PMFBY) to ensure risk mitigation and provide insurance cover for all farmers. Small farmers will be provided a pension after 60 years of age. In its last budget, an interim one, the BJP-led NDA government had announced significant tax reliefs for the neo-middle class and middle class for F.Y. 2019-20. The budget had not only allowed full tax rebate for those in the ₹5 lakh bracket but also increased standard deduction for the salaried class from ₹40,000 to ₹50,000. Party intends to continue with its tax policy in a similar manner – "lowering of tax rate thereby rewarding honest taxpayers and improving compliance." If elected, BJP will launch a new scheme to provide collateral-free credit up to ₹50 lakh for entrepreneurs. And, will guarantee 50% of the loan amount for female entrepreneurs and 25% of the loan amount for male entrepreneurs. The party like to facilitate the establishment of 50,000 new Startups in the nation by 2024 and 500 new incubators/accelerators by 2024. To setup new "Entrepreneurial Northeast" scheme to provide financial support to the micro, small and medium industries and for employment generation in the Northeastern state. BJP reiterates its stand to draft a Uniform Civil Code (UCC) to replace personal laws based on the scriptures and customs of each major religious community in India. It has been defined by Article 44 of the Constitution of India as one of the "Directive Principles of State Policy".